It must be tough to be a ruling mullah within the Iranian regime these days. Only a few months ago you must have been feeling on top of the world. Syria was a carnal house of chaos that was diverting global attention away from all of your schemes and plots. ISIS was busy destroying everything and everyone in its path and you got plaudits for claiming to fight them. You had a nuclear deal in hand that flooded your depleted bank accounts with billions in cash enabling you to go on personal shopping sprees for new weapons and upgrade your ballistic missiles and you didn’t have to give anything away for it! Your lobbying and PR machine were running an echo chamber braying loudly in support of your causes and portraying your handpicked puppet president as a paragon of moderation. ISIS is being pushed back by determined Iraqi troops and Syrian rebel groups backed by U.S. forces who have now shown a willingness to shoot Iranian drones, convoys and troops if threatened. The incoming Trump administration has openly called for and getting a legislation imposing new economic sanctions for Iran’s support for terrorism and its development of ballistic missiles. The cash flow may soon run dry as European countries, eager to invest in Iran, are now confronted with the stark possibility of running afoul of U.S. Treasury officials. Your latest presidential campaign where your boss, Ali Khamenei, tried to engineer the election of his hardline successor fell flat on its face. Worst of all, the longest-running Iranian dissident group is experiencing a resurgence in support not only in many world capitals, but more distressingly on the streets of Iranian cities. It’s enough to make a mullah want to cry, except the mullahs that control Iran and its people aren’t likely to get sentimental or panic. If anything, they will do what they have always done which is crack down on its people, engineer more attacks abroad and use its overseas lobbyists to threaten global leaders. But that same old recipe may no longer find much traction as the ground has shifted considerably on the regime. One big blow came when U.S. federal prosecutors won a courtroom victory in their nine-year effort to seize a midtown Manhattan office tower owned by an Iranian charity. A jury on Wednesday found that the charity, the Alavi Foundation, was controlled by the Iranian government. It also agreed with prosecutors that the charity’s management of the Fifth Avenue office building, which has generated millions of dollars in rental income annually, constituted a violation of U.S. sanctions against Iran, according to Bloomberg. The verdict, which came after a day of deliberations, means that Manhattan prosecutors can move ahead with their attempt to seize the building at 650 Fifth Avenue, a prime location. The government plans to sell the property, which is valued at more than $500 million, and distribute much of the proceeds to victims of Iranian regime-sponsored terrorist attacks. The finding “represents the largest civil forfeiture jury verdict and the largest terrorism-related civil forfeiture in U.S. history,” Joon H. Kim, the acting U.S. Attorney in Manhattan, said in a statement. In 2014, U.S. District Judge Katherine Forrest granted summary judgment to prosecutors’ forfeiture request, agreeing that the government had established that the building’s primary owners — the Alavi Foundation and a shell company controlled by the government of Iran — had been violating Iran sanctions laws since 1995. The blow is especially big for the Iran lobby since the Alavi Foundation was a prime financial supporter of noted lobbying groups such as the National Iranian American Council and the Ploughshares Fund, both of which are likely to be crippled by the loss of cash. This comes in contrast to the strong growth of the Iranian resistance movement within Iran, which has fought hard to stifle any news of protests from getting out, but lately those acts of defiance have grown bolder and been more publicized thanks to social media. The National Council of Resistance of Iran (NCRI)/People’s Mujahedeen Organization of Iran (MEK) says hundreds of videos and photos of the incidents have been taken in dozens of towns and cities, and compiled a sample in a video clip. Such demonstrations are highly risky in Iran, a repressive state that has outlawed the NCRI/MEK as a “terrorist” group and executes hundreds of people each year for crimes including political and security offenses. Shabnam Madadzadeh, a young Iranian woman and former political prisoner who just recently was able to exit Iran, has written articles and delivered remarks in different events shedding light on Iran’s dungeons atrocious conditions and gave a powerful interview to Forbes describing conditions in Iran’s prisons. “I was a college student in Iran and like my brother I spent five years in the regime’s jails as a political prisoner. Long interrogations, solitary confinement, forced to witness my brother being beaten, deprived of any contact with my family, death threats and mock executions were the tortures I was placed through,” she said. “During my time behind bars I was deprived of any furlough. I witnessed many crimes by the regime authorities, many executions and tortures inflicted not only on political prisoners, but also ordinary inmates arrested on other charges,” she added. It may be time for the mullahs to pull out the tissue and have a good cry. With only a few days left until Donald Trump is sworn in as the next president of the United States, the Iran lobby and their Iranian regime leaders are in an absolute tizzy about the nuclear agreement and its future. For the Iran lobby, especially the National Iranian American Council and the Ploughshares Fund, the nuclear deal with Iran represented a high water mark for their perceived effectiveness, but like a evaporating lake in a desert, their success was illusory since it was largely built on the decision by the Obama administration to try a policy of appeasing the Iranian regime. With the ascension of the Trump administration with such noted critics of the Iranian deal in many of cabinet nominees now undergoing confirmation hearings, the Iran lobby is faced with rollback of all of their gains in one fell swoop. Iran lobby supporters such as Trita Parsi have tried all sorts of tactics in an effort to save the deal in a shotgun approach of messages. First they openly criticized Trump during the presidential election, joining the tactics of his opponents with personal attacks. When that failed and he won election, Parsi and his cohorts shifted to the threat of war if the Iran nuclear deal was scrapped by Trump. When that fell on deaf ears and gained almost no traction with the media and Trump announced his cabinet picks, the attacks shifted to the nominees. Now that line of attack has essentially failed, the Iran lobby is now trying to float the idea that the Trump is actually in support of the nuclear deal and not likely to scrap it because the consequences would be so devastating. Trying to keep track of all the misses by the Iran lobby is like trying to keep track of clanks off the rim by a worst shooting team in the NBA. And now their worst fears are finally starting to come to fruition: the U.S. is finally beginning to realize that instead of appeasing the mullahs in Tehran, it is now time to hold them accountable for their actions. The Iranian lobby fears that deeds and not words are likely to be the new currency of diplomacy in 2017. But it isn’t just a Trump administration that is causing the Iran lobby to freak-out, it is the changeover in Congress and the potential for a whole raft of actions aimed at the mullahs ranging from the re-imposition of economic sanctions on the federal level to state-by-state sanctions means the Iran lobby is poised to be overwhelmed. 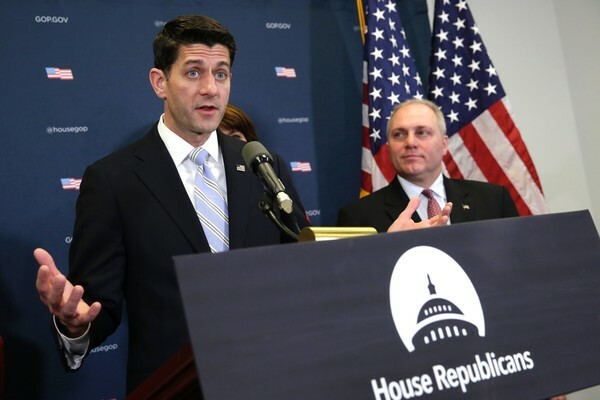 Congress has already begun offering up a series of bills taking aim at various aspects of the Iranian regime’s conduct including the near unanimous passage of the Iran Sanctions Act. Now comes a bill offered up last week to initiate an investigation into Iran Air and other regime airlines by the new Director of National Intelligence into whether or not they provide support to the Revolutionary Guard Corps or other terrorist groups. 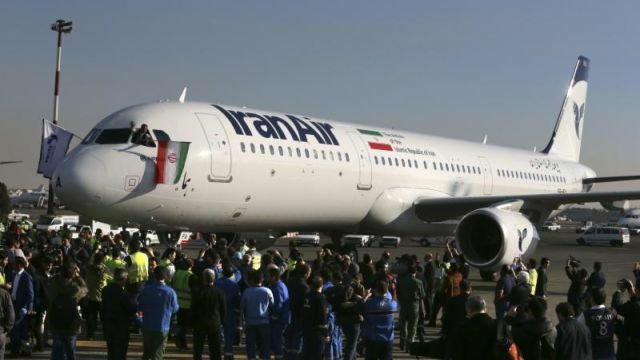 The timing of this legislation is important to the Iranian regime as it takes delivery of new commercial airliners from Airbus and soon Boeing to replace aging aircraft in its fleet. Iran Air took delivery last week of the first of 100 jets it ordered from Airbus with Boeing scheduled to deliver in 2018. Should the investigation of Iranian airlines lead to the discovery of a link between them and support for terrorist activities, the suspect airline could end up back on the U.S. sanctions list and be prevented from receiving any new aircraft or U.S.-made parts according to CNN News. There has always been deep suspicion that the Iranian regime uses commercial airliners to ferry troops, ammunition and cash to hotspots such as Syria and Iraq. Should that link prove true, the Iran lobby could find itself fighting for the economic survival of the regime again. Mahan Air, Iran’s second biggest carrier, is still on the sanctions list for aiding Iran’s military and is barred from buying Western planes and parts. Iran Air was removed from the U.S. sanctions list in January 2016 as part of an agreement to convince Iran to restrain its nuclear program. It opened the path for multi-billion dollar sales by Boeing and Airbus. That prompted an outcry from some lawmakers who said the Obama administration offered no proof that Iran Air had stopped its support of the Iranian military or designated terrorist organizations. The news for the Iran lobby got worse with the release of a letter from 23 former U.S. officials urging the Trump administration to open up a dialogue with Iranian dissident groups, specifically the National Council of Resistance, which counts as one of its members the People’s Mujahedin Organization of Iran; a dissident group the mullahs in Iran have made it their mission to pursue and destroy. In spite of these changing political fortunes, the Iranian regime seems intent on maintaining the same militant attitude to the rest of the world as news came out of Iran of the mass execution of 20 prisoners over the past two days. Amnesty International reports indicate that Iran executed at least 977 people in 2015, mainly for drug-related crimes. The human rights activist NGO also blames Iran for continuing to execute juvenile offenders, those aged under 18 at the time of the crime, in violation of the international law. For the mullahs, some things don’t change. We’ve already chronicled recent efforts by the National Iranian American Council to try and save the flawed Iran nuclear agreement with a flurry of press releases, editorials and social media posts in an attempt to attack everything from President-elect Donald Trump’s tweets to his Cabinet selections. Not to be outdone, the other leader in the Iran lobby stepped up the plate with another media blitz by the Ploughshares Fund, which sent out its own editorials in an effort to dredge up the same old arguments similar to the arguments used by the Iran lobby during the run up to the nuclear agreement last year in which groups such as Ploughshares and NIAC tried to portray anyone opposed to the deal as a militaristic hawk hell bent on carpet bombing Iran. In the year since the deal was approved, it is ironic to see the Iranian regime being the one to carpet bomb cities in Syria and funnel arms to terrorist proxies and militias in Iraq and Yemen. Of course Ploughshares offers no editorials condemning the cycle of war and violence the Iranian regime feeds and nurtures. Paul Pillar, a former intelligence officer that has been penning on behalf of the Iranian mullahs in various occasions, joined at the hip to the Ploughshares Fund, offered up one such editorial in the National Interest in which he pedaled the same old idea that anyone critical of the Iran nuclear deal was a neo-con war hawk. Pillar again raises the specter of the Iraq war as a harbinger of war with Iran in order to try and scare readers as he bangs the drum against President-elect Trump. That last statement by Pillar really demonstrates how bought in he is for Iranian regime, when he makes no mention of the devastation Iranian regime’s military actions in the region have caused. Unlike what Pillar says, the aggression is coming from Iran. But Pillar wasn’t the only Iran lobbying ally to get in on the act, Tytti Erästo, a fellow at Ploughshares, also offered up her own editorial at the National Interest as well trying to sell the idea that Trump needs the Iran nuclear deal to engage with Russia and North Korea. She tries to make the case that North Korea would somehow view an intact nuclear deal as the appropriate pathway since it would demonstrate the benefits of diplomacy. North Korea is widely regarded as the world’s most notorious rogue state after it consistently broke every international agreement negotiated with it. Yes, that sounds like a wonderful template of how Iran can positively influence North Korea! And how could nuclear deal influence anyone, particularly since we are talking about a flowed agreement with no teeth that provides ample exemptions and waivers for violations and lift all economic sanctions without the need for compliance monitoring? In fact, her statement reflects a key component of all the Iran lobby’s positions which is that the International community bears the burden for compliance and any failure in the agreement must stem from the U.S. and others not from anything the Iranian regime did. It is the same frivolous thinking that paved the way for a badly flawed deal which led us to the crises the world currently faces. While such efforts by the Iran lobby reveals the weak position and the fear the mullahs have, it also proves that the right policy towards Iran is and has always been a firm policy that should hold the Iranian regime finally accountable for its actions and not the other way around. The National Iranian American Council has gotten virtually nothing correct over the last three years when it comes to predicting the behavior and actions of the Iranian regime. That in and of itself should not be too surprising since in its role as a chief advocate and lobbying force for the Iranian regime, its responsibility is not to journalistic fact, but to lobbyist advocacy. That fact alone should make any journalist talking to them or reading their publications slightly skeptical from the outset. Also, it is erroneous to consider the NIAC a “human rights” organization when its stated mission goal of helping Iranian-Americans is plainly shown to be ignored at best and duplicitous at worst since the NIAC does not mount media or grassroots efforts on behalf of imprisoned Iranian-Americans in Iran. Nor does the NIAC ever join with mainstream human rights groups such as Amnesty International in pressing the Iranian government to release these American hostages. While the NIAC takes out full page ads in the New York Times touting the moderation of the Iranian regime, it does not similarly take out full page ads critical of Hassan Rouhani’s public statements in which he reaffirms the regime’s policy of not recognizing dual citizenship; the only nation on the planet to do so. The NIAC promised Iranian moderation in light of a new nuclear agreement, but in the 18 months since, Iran has embarked on what is arguably the widest range of war, insurrection and human rights abuses spanning four countries including Syria, Iraq and Yemen. At home it has defeated, removed and imprisoned virtually all political opponents. It has resorted to mass arrests of students, journalists, artists, bloggers and anyone else showing any inkling of rebellion to the mullahs. It has conscripted Afghan refugees to fight and die as mercenaries in Syria, while it brought Russia into the conflict resulting in the mass bombing of civilians, hospitals and reduced Aleppo to a pile of dust. All of these things NIAC promised would not happen, yet it has all come to pass. 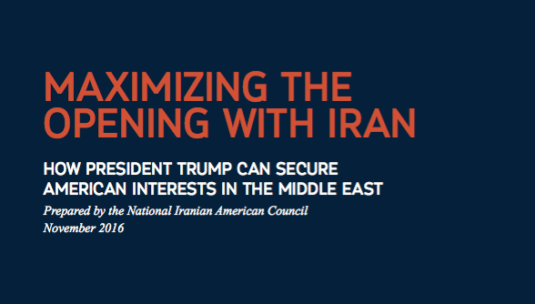 Now the NIAC has issued a 45 page “report” of recommendations to the incoming Trump administration on how to secure American interests in the Middle East. While mildly entertaining as a work of fiction, the Trump transition team would be wise to consider using this report to wrap up food leftovers since that is all it is good for. This document is nothing more than a retread of the same tired and now proven false assumptions the NIAC has been peddling now for the past decade. It loses all credibility for one basic omission: It never acknowledges nor criticizes Iran’s role in the escalation of tensions and bloodshed in the Middle East. That’s like blaming the weather for a mass murderer on the loose. If one understands that the NIAC is an Iranian regime advocate and not a human rights organization, it is easy to understand the priorities it places on its discussion topics in the document. It places the nuclear agreement and the U.S. alliance with Saudi Arabia as its two more important topics, which coincidentally are the two most pressing concerns for the Iranian regime. It then dives into Iraq and Syria, the two principle battlefields Iran is involved with in creating its Shiite sphere of influence. Oddly, the report does not mention Yemen or the rise of Islamic militants in sub-Saharan Africa which are now responsible for instability stretching from Egypt to Nigeria to Yemen. Lastly, the report devotes a scant three pages to human rights and only from the perspective that Washington can only improve human rights by essentially trusting the Iranian regime to do the right thing if Washington caves in and appeases the mullahs fully. The one thing the report does say is that the Trump administration “should heed the advice of Iranians themselves.” On this point, NIAC is correct, but not in whom it believes are the right Iranians to listen to. The Trump administration needs to part ways from failed policies of the Obama administration and muzzle the “echo chamber” of Iranian lobbying it created. It needs to chart its own pathway and listen to the concerns, thoughts and advice of Iranian dissidents and opponents both within Iran and outside. Let the Iranian people counsel on what are the best approaches to bringing back a secular, democratic government in Iran. That kind of advice is not likely to come from the NIAC, Ploughshares Fund or similar Iranian lobbyists. It will come from opponents such as the National Council of Resistance of Iran, Amnesty International and outspoken leaders on the human rights situation in Iran such as Rudy Giuliani and Sen. Robert Menendez (D-NJ). The overwhelming number of these so-called “experts” is in reality advocates and lobbyists for the Iranian regime or commercial interests tied to the Iranian regime such as Bijan Khajehpour, managing partner of Atieh International which works to line up foreign businesses with Iranian-state industries. Mainstream media outlets would do well to finally stop quoting these sources that are as accurate as pollsters on election night. The decision by the House to renew the Iran Sanctions Act is noteworthy for two things: One is the margin, an overwhelming 419-1 vote that clearly demonstrates on this one issue, both Democrats and Republicans universally agreed on the outcome. The second is that the age of appeasing the Iranian regime and giving credence to the Iran lobby’s echo chamber on “moderation” has finally died in the wake of an unrelenting year of war, carnage and bloodshed by Iranian regime and its terrorist proxies following approval of the nuclear deal. It is universally agreed to even among the most ardent supporters of the mullahs in Tehran that Iran could have done more to demonstrate its commitment to being a reliable international partner. The fact that a lame duck session of the House voted these sanctions through says lots about how members truly feel. While there is no disagreement about wanting to compel Iran mullahs to not build nuclear weapons, the methodology of how to get there is clearly and appropriately back up for debate. The ISA itself, extended for another decade by this vote, is not even connected to the nuclear deal since it deals with sanctions imposed for Iran’s support for terrorism and development of ballistic missiles; items that Iran lobby supporters such as the National Iranian American Council famously argued should be disconnected from the nuclear deal. They are now paying for that disconnect. The other sanction, which was passed on a unanimous voice vote no less, imposes sanctions on anyone assisting the Syrian regime in the wholesale slaughter of civilians and contributing to the largest refugee crisis since World War II. Given that Iran is Syria’s biggest sponsor and supporter, the message to Tehran is clear: Get out of Syria and stop supporting the mass murder of men, women and children. Ultimately the best thing to come out of these moves will be to refocus the debate on human rights and the barbaric practices of the Iranian regime and Syria. The renewal and extension of the ISA and the sanctions connected to Syria provides the incoming Trump enormous flexibility and tools as it takes up the thorny question of how to roll back Iranian aggressions. The Iran lobby has been busy trying to make the case that the status quo needs to continue and in fact grant Iranian regime even more concessions with the further lifting of restrictions preventing the regime from tapping into U.S. currency exchanges to finance its activities, but even a blind man can recognize the American voter was in no mood to accommodate Iranian regime during a time when fears over terrorism was ranked as the second-highest concern they had in exit polling right after the state of the economy. Both Democrats and Republicans realize their political careers might be cut short if they followed through with President Obama’s desire to maintain the status quo. It is clear from the dramatic results from the election that Americans want change and they are willing to decimate the political class to get it. For the Iran lobby, especially long-time advocates such the NIAC and Ploughshares Fund, their options have narrowed dramatically to have any leverage with the new Congress and the Trump administration, which is why they have shifted their focus to a shotgun approach of trying out any number of message points and see if any of them stick. One of the stranger rationalizations offered by Trita Parsi of NIAC, is that trying to isolate the Iranian regime may prove difficult for Trump since the Obama administration first made the case that Iran had failed to cooperate and thus was able to assemble an international coalition. But Parsi must be nuts to think the international community doesn’t recognize that Iran has been at the very center of three of the worst raging wars on the planet today in Syria, Iraq and Yemen. Parsi even pins his hopes on Iran’s fight with ISIS as a saving grace for Trump that may spare Iran from retaliatory sanctions for sponsoring other terrorist groups such as Hezbollah. By his logic, giving Iran a hall pass for fighting one murderous group of thugs while supporting another murderous group of thugs is somehow a good thing. Of course Assad’s definition of “terrorist” might be very different from the American definition given his military’s targeting of civilian neighborhoods and hospitals with airstrikes, barrel bombs and chemical weapons. What Parsi, Assad and even the mullahs in Tehran do not understand is that Trump is far from the knee-jerk, knuckle dragger they tried to portray him as during the presidential campaign. Far from it, Trump has focused his policies on the idea of restraining Iranian regime influence and resetting the power balance in the Middle East away from Iran and back towards global powers. His openness towards working with Russia and Vladimir Putin presents a more subtle and unique threat to Iran since Putin might even make the calculation that forging a partnership with the U.S. negates the need for supporting Iran’s interests so long as preservation of a warm water port in the Mediterranean from Russian ships is guaranteed. For Iranian mullahs, the field is narrowing in terms of their ability to affect outcomes, which is why the Iran lobby has been campaigning hard to influence who will be sitting on key positions of the upcoming administration. Why is the Iran Lobby Silent About Ransom Demands? One of the curious side notes during the increasing concerns over news streaming out of Iran about harsh prison sentences being imposed on Iranian-Americans is that the Iran lobby has been relatively silent on the issue as a whole. Leading Iranian regime supporter, the National Iranian American Council, felt compelled to issue a statement when Siamak Namazi and his father received 10-year prison sentences. Earlier news reports detailed a personal friendship between Namazi and NIAC founder Trita Parsi which may explain the latter’s willingness to criticize the Iranian regime on this one issue. But for the rest of the Iran lobby, leading sympathetic journalists and bloggers such as Jim Lobe of Lobelog.com have been virtually silent on the issue of hostage taking of dual nationals by Iran. Considering the goals and aims of the Iran lobby to preserve a badly flawed nuclear agreement and combat negative stories about the regime, it’s understandable why this practice hasn’t received much defense from them because it really is an indefensible action. The issue of ransom and hostage-taking is deeply troubling and likely to only increase since the Obama administration has made it clear it will do nothing to jeopardize the nuclear agreement which it considers its signature foreign policy agreement. But while the administration does not consider the shipment of $1.7 billion in pallets of cash to be a “ransom” for the release of five Americans last year, the mullahs in Tehran certainly and eagerly perceive it that way; all of which presents a problem for the arguments made by the Iran lobby of a newly moderate Iran. If the US does not call this hostage taking and ransom payments, but Iran does, then in whose scenario should we be more worried about? The US government for acting as if these are part of the normal diplomatic process or a regime that views this as a new form of commerce? For many lawmakers on Capitol Hill, the distinction is not difficult to discern. For many Republicans and Democrats, the practice of hostage taking, sham secret trials, lengthy prison sentences and demands for cash are to be taken seriously and dealt with strongly. 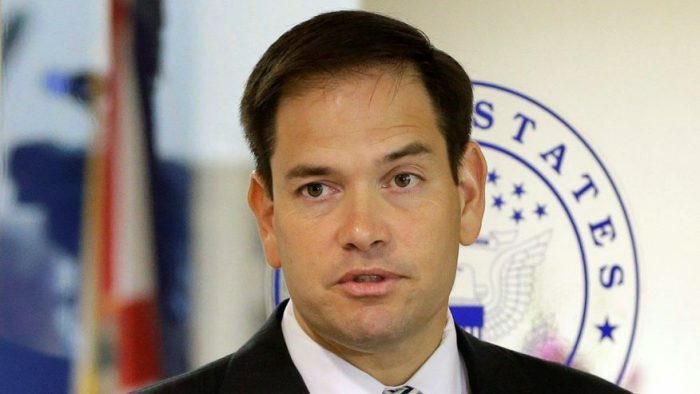 “President Obama’s cash ransom payment to Iran makes Americans more vulnerable and encourages unjustified prison sentences and blatant kidnapping like this,” Florida GOP Sen. Marco Rubio told FoxNews.com on Wednesday. “Senior Justice Department officials warned the White House that Iran would view the pallets of cash as ransom, but the president didn’t listen, and now Iran is taking more hostages and demanding more money,” he added. “Once again Iran has made a mockery of its own legal system in convicting wrongfully detained Iranian-Americans,” California GOP Rep. Ed Royce, chairman of House Foreign Affairs Committee, said after reports of the Namazis’ sentencing. The State Department last week said the Namazis were “unjustly detained” and called for their immediate release. Lawmakers also have suggested that Iran has been further empowered by the U.S.-led international pact signed in July 2015 in which Tehran agreed to curb its development of a nuclear weapon in exchange for countries lifting billions in sanctions. Most distressing were reports from Nizar Zakka, a Lebanese citizen and permanent resident of the United States, who said through his attorney Tuesday that Iranian officials in April told him it would take as much as $2 billion to ensure his release from captivity. In September, Iranian officials lowered that amount to $4 million, and told him that he was spared the death penalty but would remain in prison for 10 years until the payments are made. “On behalf of Nizar, we request that all be done by the U.S. and other governments to secure his unconditional release from captivity on humanitarian grounds,” he added. Zakka, an advocate for Internet freedom whose nonprofit group did work for the U.S. government, denies the spying charges. He believes the Iranian government, lured him to Tehran in order to seize and imprison him. He was arrested in Iran after traveling there to attend an International Conference and Exhibition on Women in Sustainable Development at the invitation of an Iranian office who asked him to serve as one of the events speakers. If this is true, it is even more disturbing since it implies the regime is now actively targeting dual nationals and working to bring them back to Iran for arrest and imprisonment. In the case, of Reza “Robin” Shahini, the San Diego, California resident just sentenced to 18 years in prison, regime officials indicated he was being sentenced based on posts he made on his Facebook page during the protests against the 2009 elections, which were widely considered fraudulent and condemned by international observers. If so, that would indicate the regime’s active scouring of social media to pick up tidbits that could be used as justification to arresting any dual national, even though those just coming to Iran to visit relatives. It is a disservice for the Iran lobby to remain mute on this subject. Every day the NIAC and other supporters stay silent, it only heightens the legitimate criticisms of them being tools and puppets of the mullahs. Why Does the Iran Lobby Want to Make Iran a Partisan Issue? 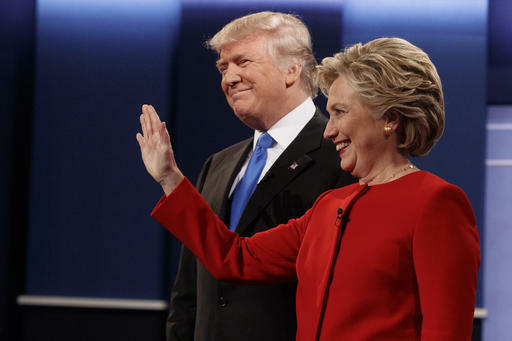 The first debate between Hillary Clinton and Donald Trump was billed as literally the fight of the century; bigger than Ali vs. Frazier, bigger than Coke vs. Pepsi. While an innumerable number of columnists, analysts, lobbyists and anyone else with “-sts” at the end of their job description will critique this debate to death, we should be asking a question that didn’t come up in the debate. Why does the Iran lobby want to make the issue of Iran a partisan political issue? From the moment the Iran lobby was created, especially the launch of its principal leader—the National Iranian American Council—it has sought to wedge itself into the partisan political environment by trying to align itself with Democrats and attacking Republicans for the past several years. At first it may have been because Republicans were the most visibly opposed to accommodating the mullahs in Tehran, but the NIAC even held its fire when it came to criticizing prominent Democrats opposed to Iran accommodation such as Sen. Robert Menendez (D-NJ), a prominent critic of the Iranian regime. It was also no coincidence that many of NIAC’s staffers formerly worked for Democratic office holders and organizations, but that is a superficial reason for its efforts to politicize Iran issues. The blueprint for this tactic comes from the mullahs themselves as displayed in their energetic efforts to tar and feather Saudi Arabia and portray its chief regional rival as the source of all terrorism and evil in the world. It’s a blatant effort at diverting attention away from Iran’s own failings and blunt criticism for its long support for terrorism and brutal human rights record. If you treat any criticism of the Iranian regime as merely political point scoring, the NIAC and other supporters are hoping it diminishes the power and effectiveness of the criticism. The only problem with that argument is when both Democrats and Republicans both take aim at the regime anyway. In stark contrast to that cynical tactic, Iranian dissident and opposition groups such as the National Council of Resistance of Iran have worked diligently to build bridges on both sides of the political aisle and worked on unifying themes such as human rights, support for women and opposition to sponsorship of terrorism. Those efforts have won over many on both sides of the aisle with members such as Democratic House Leader Nancy Pelosi (D-CA), former Democratic Sen. Joe Lieberman, House Foreign Affairs Committee chair Ed Royce (R-CA), and former New York mayor Rudy Giuliani just to name a few. Ultimately the Iran lobby must pursue this diversion strategy since its typical message points about Iranian cooperation and moderation have dissolved in a flurry of aggressive, militant and shocking moves by the mullahs since the nuclear deal was sealed and the “echo chamber” of support was revealed by the news media. With the news coming out of Iran since the passage of the nuclear deal being mostly bad and only getting worse, the Iran lobby finds itself in a pickle with the upcoming presidential election promising a new president who plans to hold the Iranian regime much more accountable whoever wins. The regime’s top mullah, Ali Khamenei, tried to snuff out an insurgent return to the political stage by widely reviled past president Mahmoud Ahmadinejad who has hinted at a challenge to Khamenei’s handpicked minion, Rouhani. 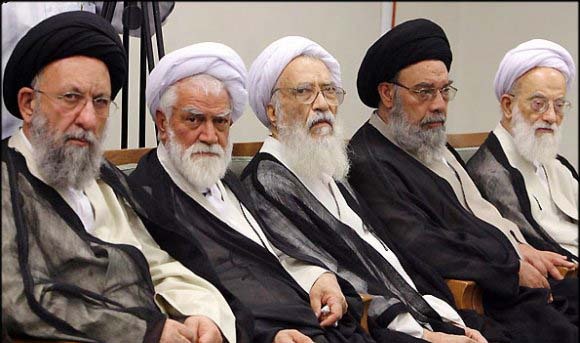 The turmoil the Iranian regime is facing highlights the schisms that are running through Iranian society and the deepening split between the mullahs and the Iranian people. It also explains why the Iran lobby is so intent on trying to portray Iran policy issues as partisan political ones and not worthy of the attention of media. Unfortunately for the Iran lobby, the American people, who have been subjected to near constant attacks inspired by extremist Islamists and worry about the growing carnage around the Middle East caused by Iranian regime’s active support of three proxy wars, have begun to suspect any supporter of the mullahs. This may explain why the only people in America openly supporting the Iranian regime are those directly connected to the Iran lobby such as the NIAC, Ploughshares Fund and their cohorts. How much does it cost to meet your lawmakers in a venue where you can exert the influence of the mullahs in Tehran? Apparently only $349 and that also gets you three lunches and two breakfasts! But if you’re strapped for cash, maybe because you have to pitch in for your family to hire a lawyer in an effort to reach your dual-nationality relative who is sitting in Evin prison in Iran, for only $175 you can still get access to lawmakers, but you miss out on a “Gala Reception” and hors d’oeuvres. So less pizazz, but still you can buy access and who is selling this access at such bargain rate prices? The National Iranian American Council which held its “Leadership Conference” this weekend in Washington, DC. The conference was a veritable who’s who of Iranian regime activists and lobbyists, all previously dedicated foot soldiers in the fight for securing a nuclear deal with Iran, as well as the fight to buy reprieves for the regime from ongoing sanctions for violations of human rights and sponsorship of terrorism. 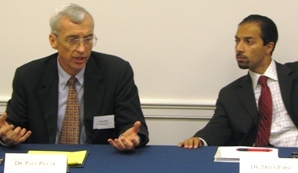 Some of the more notable speakers included Joseph Cirincione of the Ploughshares Fund,which received and distributed cash to various members of the Iran lobby including NIAC according to investigative media reports, Ben Rhodes, deputy national security advisor to President Obama and architect of the now-infamous “echo chamber” of supporters used to deceive media and the American people as to the inherent flaws of the nuclear agreement. Other key participants curiously included Christopher Backemeyer, deputy coordinator of sanctions policy in the State Department, and Michael Mosier, associate director at the Office of Sanctions Policy & Implementation in the Office of Foreign Assets Control. These two men hold considerable power over the question of whether or not Iran is complying with the nuclear agreement and whether or not certain sanctions should be enforced such as bans against the regime accessing US currency exchanges. The fact that such key regulatory officials are participating in a conference sponsored by an organization identified as having strong links to high ranking Iranian officials should prove troubling. It is similar to having members of the Treasury Department’s securities enforcement division having drinks with executives from Enron or Lehman Brothers prior to the mortgage meltdown. What is always fascinating about the NIAC’s annual confab is the packing of the speakers list with its own staffers, in this case Trita Parsi, Reza Marashi and Tyler Cullis, each of whom have worked diligently to carry Iran’s water and make excuses for the worst excesses of the regime. Watching these three “stooges” try to divert attention away from ballistic missile launches, mass arrests of journalists, public hangings of Iranians or arrests of Americans, Brits and other citizens is like watching a bad sketch comedy troupe. Considering that one of the self-proclaimed mandates of the NIAC is “to ensure that human rights are upheld in Iran and that civil rights are protected in the US. NIAC believes that the principles of universal rights – Freedom of assembly, religion, and speech, as well as dignity, due process and freedom from violence – are the cornerstones of a civil society” one might ask why NIAC never invites any of the Iranian-Americans who can tell their story first hand of what Iranian justice is like. 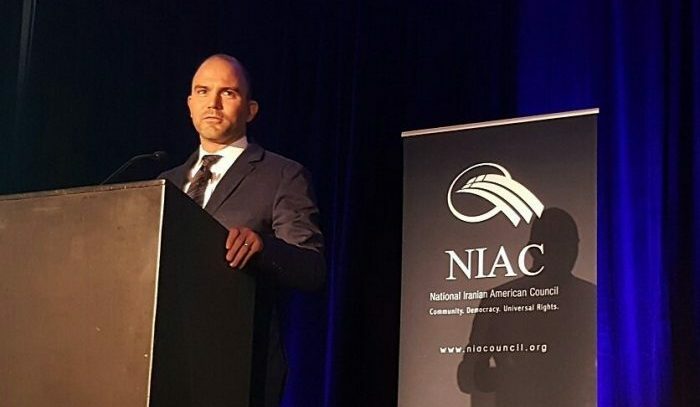 Why is it that NIAC never has people such as Saeed Abedini, the Christian pastor held and tortured in Iran, or Amir Hekmati, the former US Marine brutalized in prison, or Jason Rezaian, the Washington Post reporter, to attend a conference and tell their story in furthering an understanding of the terrible forces at work within Iran’s religious leadership? Of course the NIAC would never showcase any of these Americans since their presence would be a terrible embarrassment and highlight the true nature of the Iranian regime which is cruelty, punishment, abuse and control. Even though these Americans were released in exchange for $1.7 billion in cash, more Americans have been taken this year and the NIAC holds no fundraiser for them; launches no grassroots campaign for their release and holds no protest in their honor. Even after the regime’s president, Hassan Rouhani, appeared on NBC prior to his speech before the United Nations General Assembly, he confidently admitted to Chuck Todd that Iran did not recognize dual nationalities. And yet the NIAC issued no condemnation, no rebuke, not even a single tweet objecting to the extralegal procedures against Iranian-Americans, which the NIAC was ostensibly working on behalf of. The height of absurdity was reached and exceeded by several speakers at this weekend’s proceedings, including this juicy quote from Rhodes. “Acceleration of tensions between Gulf partners and Iran is a serious problem across the region,” said Rhodes as quoted by NIAC. You think? It might be one of the better understatements, ranking up there with “peace in our time” by Neville Chamberlain. The Iranian regime has pushed the possibility of all-out conflict with regional rival Saudi Arabia, while at the time supporting three proxy wars in Syria, Iraq and Yemen that have claimed the lives of almost 750,000 people. NIAC’s promises that Iran would be a partner for peace and moderation following the nuclear deal have turned out to be false and alarmingly so. What was promising was the position taken by Philip Gordon, a senior foreign policy advisor to Hillary Clinton and senior fellow at the Council of Foreign Relations, who reiterated the presidential candidates public statements of skepticism about Iran’s conduct and the need to “distrust and verify” when it comes to enforcing the nuclear deal, much to the chagrin of Parsi who tried everything short of begging to get Gordon to make positive statements about the regime. Gordon’s reticence provides hope that the next president will approach Iran with a clean slate and not be motivated to the falsehoods and “echo chamber” of the NIAC. Ever since the U.S. and other nations entered into negotiations with the Iranian regime over a nuclear deal and completed it more than a year ago, critics including the Iranian resistance movement have been warning that a deal that did not also address the regime’s poor human rights record, oppressive government and support of terrorism would inevitably prove fruitless and only empower and embolden the mullahs in Tehran. The Iran lobby also argued strongly that the nuclear deal would help “moderate” the regime and open the door for more liberal elements of the government to make gains. Notable regime supporters such as Trita Parsi of the National Iranian American Council and Ali Gharib pushed the idea that Iran could help stabilize the volatile Middle East once a deal had been passed. Even sympathetic editorial pages and commentators were actively encouraged by the administration to support the deal on the basis that it would bring economic benefits to the Iranian people long beleaguered by crippling sanctions and gross corruption and mismanagement by regime officials. Over the past year, reality has set in and the world has discovered that virtually none of those promises and assurances ever came true and in fact the litany of woe heaped on the world by the rising tide of radicalized extremism flowing from Iran since the nuclear deal has all but reshaped the landscape of the U.S., Europe, the Middle East, Africa and even touched Latin America. The luxury of 20/20 hindsight has allowed the world to see the results of the nuclear deal and it is hard for even the most ardent member of the Iran lobby to put a positive spin that is remotely believable. Things are so blatantly obvious that even the State Department has finally conceded that the nuclear deal may have in fact emboldened the Iranian regime to commit even more aggressive and militant acts; not diminish it. Under questioning from Fox News reporter James Rosen, State Department spokesman Mark Toner could not rule out that the deal “has served as a cause for this more aggressive posture” by the regime. Rosen noted, Iran had recently threatened to shoot down two US Navy surveillance planes in international airspace. This was just the latest in a growing list of provocations, including taking 10 US sailors hostage and abusing them in violation of international law. The New York Post editorial board was flabbergasted by the admission since if the Obama administration had even an inkling of this aberrant behavior on the part of the mullahs, it made no sense to continue a policy of appeasing them, including bending over backwards to ship the regime $1.7 billion in hard cash in exchange for American hostages. “Especially, we’d add, an Iran grown even more aggressive and hostile precisely because of that very deal. “The logic here is just mind-boggling. “Yes, Iran has been emboldened by a deal that gives it billions in cash now and an easy road to going nuclear in a few years — thanks to a president who won’t dare challenge Tehran’s behavior and risk undoing his dubious diplomatic legacy. “Nice to see someone finally admitting as much,” the Post added. The Iranian regime isn’t taking the potential for blowback lightly. Iran’s semi-official ISNA news agency reports that the country’s foreign minister and his international counterparts will meet this month to discuss “some differences” over the implementation of the landmark nuclear deal. The Wednesday report says they will focus on banking sanctions, which Iran complains have not been fully lifted. The meeting will take place Sep. 22, on the sidelines of the United Nations General Assembly, where the regime’s Hassan Rouhani is scheduled to speak in what we can only assume will be a verbal tongue lashing blaming the U.S. for a wide range of problems resulting from a now failed nuclear deal. It has been clear from statements made by regime officials such as Ali Khamenei and members of the Iran lobby that the regime has shifted focus now to condemning the U.S. for the inability of the regime to participate in U.S. currency exchanges because of sanctions put in place for its support of terrorism and not related to the original nuclear deal. The Iranian regime also recognizes that since the deal was passed, its conflict with Saudi Arabia, especially in Syria and Yemen, is stalling its plans for regional hegemony under a radicalized Shiite banner. The influence of Saudi Arabia in standing up to Iran including its active fighting in Yemen and interception of Iranian boast trying to smuggle illicit weapons through the Persian Gulf to Houthi rebels in Yemen has been effective and annoying to the mullahs in Tehran. This helps explain why the Iranian regime has turned its attention and that of the Iran lobby into a full-blown smear campaign aimed at Saudi Arabia, and by association the U.S. This can be seen in an editorial appearing in the New York Times penned by Mohammad Javad Zarif, the regime’s foreign minister, blaming Wahhabism and Saudi Arabia in particular for literally every terrorist act being committed around the world and chastised the Kingdom’s large lobbying efforts. It is a preposterous piece since it blames Saudi Arabia for exactly what the Iranian regime is doing itself with its own substantial investment in PR firms, lobbyists, paid analysts, bloggers and commentators, as well as spreading cash to a large number of so-called grassroots organizations such as the Ploughshares Fund which strongly advocated for the nuclear deal. Danielle Pletka, senior vice president for foreign and defense policy studies at the American Enterprise Institute, took Zarif to task and ticked off the Iranian regime’s own bloody history of support for terrorism around the world in a piece appearing on AEI’s site. The first step in recovery for any addict is to admit they have a problem. We can only hope this admission by the State Department will be the first step in confronting the Iranian regime forcefully, honestly and openly again. British Labor Party Leader Jeremy Corbyn found himself in some hot water when he admitted in a televised interview on Pink News that he took a $26,000 payment to appear on the Iranian regime’s state broadcaster as a pundit in which he criticized other countries human rights record. He accepted these payments after hosting five shows on Press TV between 2009 and 2012. The irony of his admission on Pink News, a news outlet focusing on LGBT community issues, wasn’t lost on one viewer who called into the show calling him a “hypocrite” for appearing on a channel that was banned from the UK for its role in filming the torture of an Iranian journalist according to the Daily Mail. What was even more incredible was Corbyn’s attempt to defend the payment, insisting it “wasn’t an enormous amount” of money. 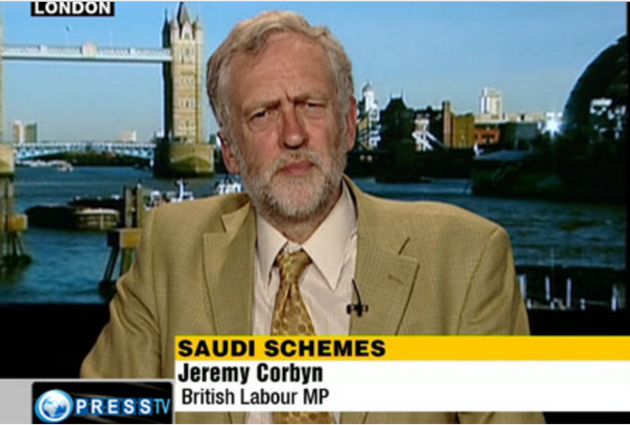 Corbyn was rightly challenged by viewers considering the regime’s dismal human rights record. It was during one of his appearances on Press TV when he made his much-criticized comments saying it was a “tragedy” that Osama bin Laden had been killed and not put on trial. Corbyn’s appearances and the timing of his appearances reinforces what has recently been revealed about then depth and scope of efforts by the Iranian regime to influence Western countries during the run-up to the negotiations for the nuclear agreement last year. Corbyn’s recruitment and payment is especially troubling since he is a sitting member of government and his appearances came shortly after the brutal crackdown over the disputed elections of 2009 in Iran and the crushing of democracy demonstrations as part of the so-called Arab Spring movement. The fact that the regime was paying Corbyn, coincides with its support of the broader Iran lobby including support for institutions such as the National Iranian American Council and Ploughshares Fund that were part of the Obama administration’s “echo chamber” of support for the nuclear deal. The Iran lobby’s shadowy connections to various bloggers and journalists such as Jim Lobe and Ali Gharib, as well as academics and members of so-called think tanks have been examined by many news organizations that have worked to uncover the tentacles of the regime’s effort to influence government policies in the West. Now the NIAC’s official lobbying arm, NIAC Action, is actively trying to influence various U.S. Senate races this fall in an effort to unseat opponents of the Iran nuclear deal and replace them with other candidates more publicly sympathetic and supportive of the regime. The Iran lobby has also sought to provide more political cover for those supporters and elected officials who are feeling the heat of critics of the regime, especially in light of the past year since the deal, which has seen the situation in the Middle East deteriorate badly and the Iranian regime at the center of three proxy wars in Syria, Iraq and Yemen. One supporter of the Iran agreement is Sen. Cory Booker (D-NJ) who was on the receiving end of blistering editorial by Shmuley Boteach, executive director of The World Values Network in The Hill. “Would Cory condone the Obama Administration sending Iran $400 million in cash in January, which experts say is utterly unprecedented, and which will undoubtedly be funneled to terror groups like Hezbollah”? Boteach writes. “And speaking of Hezbollah, how could Cory, on the one hand, tell us that on his trip he saw firsthand the terrible humanitarian disaster of Syrian refugees, yet on the other defend giving $150 billion to Iran which is being used to prop up the genocidal government of Bashar Assad? Assad’s government, and its wholesale slaughter of the Syrian people, is what created this humanitarian disaster in the first place, along with nearly half a million Arab dead and millions of refugees. And Iran is a key ally keeping Assad in power. Cory could easily have condemned Iran’s support of Assad’s Arab genocide. Instead, he chose to remain silent,” he added. The ability of regime supporters and the Iran lobby to cover for the regime’s bad actions is proving more difficult as the regime obliges by engaging in more provocative behavior, such as the recent deployment of Russian S-300 missile batteries at its Fordow nuclear facilities; an action the Wall Street Journal said was clear sign of the failure of the nuclear agreement in an editorial. “Iran seems bent on exposing the nuclear-deal illusions of President Obama even before he leaves office. The latest sign came Sunday, when Iran’s state-run media aired footage of the S-300 air-defense system maneuvering around Fordow,” the Journal said. “Meanwhile, the Obama Administration refuses to sanction Moscow for the transfer. Congress has enacted at least three bills either requiring or authorizing the President to sanction actors that help Iran acquire or develop advanced, destabilizing weapons like the S-300. Yet so far Washington has done little more than grumble and vow to ‘monitor’ Iran’s S-300 capability. President Obama made nonproliferation one of his priorities, but he will leave office amid a spreading nuclear threat thanks in part to his infinite patience with global rogues,” the paper added. There is going to be a price to be paid for supporting the Iranian regime. We only hope officials such as Corbyn and Booker figure out they should stop being beholden to the mullahs in Tehran.